Atlantis' astronauts strapped into the space shuttle Thursday for a practice launch countdown more than two weeks before they are scheduled to blast off on a mission to resume construction of the international space station. 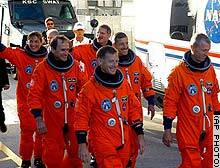 The six crew members, dressed in their orange spacesuits, waved to photographers as they walked out of crew quarters at the Kennedy Space Center and boarded a van that took them to the launch pad. The launch window opens August 27. The practice went smoothly with the countdown clock stopping at 4 seconds, said NASA spokesman Bruce Buckingham. There have been only two shuttle flights since 2003's Columbia disaster killed seven astronauts. The launches of Discovery in 2005, and again last month, were test flights to demonstrate whether NASA had solved the problem of foam falling off the external tank that doomed Columbia. But launches will become more routine because NASA and its international partners need 15 more shuttle flights, averaging about four a year, to finish building the space station before the space shuttles are grounded in 2010. Atlantis' mission will be the first in more than three years to resume construction on the space station, which is only half-built. Atlantis' commander, Brent Jett, described the schedule on the 11-day mission as the most aggressive in the shuttle program's 25-year history. A spacewalk is scheduled for the day after the shuttle docks with the space station, and two other spacewalks are scheduled in the following days. "I think the most challenging thing for us on this flight is going to be our timeline," Jett told reporters Wednesday. "We've put together a very aggressive first five or six days." Atlantis is delivering to the space station a 35,000-pound, 45-foot-long addition that includes two solar array, wings that eventually will provide a quarter of the power on the completed station. NASA managers will decide whether to give final approval for the launch at a meeting set for next week at the Kennedy Space Center. Some engineers had expressed reservations about the last shuttle flight over concerns about the design of the foam on the tank, but the success of that flight put to rest many of those worries. The launch window is from August 27 to September 13, but NASA managers want to launch in the early part of the window to avoid a scheduling conflict with the Russian space agency, which is set to launch a Soyuz vehicle to the space station in mid-September.